Quick summary: In this finding out lesson, students will watch a short video overviewing the concept of democracy, then outline their current understanding of democracy by completing the 3-2-1 Bridge visible thinking routine. In a role play class vote, students will consider the democratic right to vote, and what it feels like to be excluded from it. They will then work in groups to conduct in-depth research into two groups that struggled for the right to vote in Australia: Aboriginal and Torres Strait Islander peoples and women. 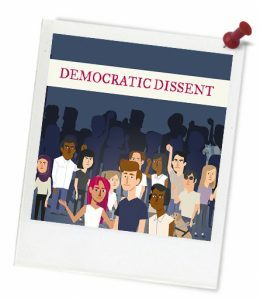 Students will present their findings to their peers, and connect the actions of these groups to the concept of democratic dissent. 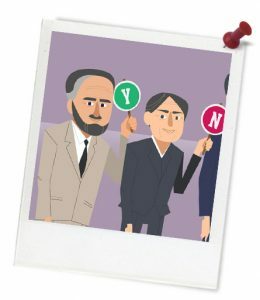 What is a democratic process? How do democratic processes link to our rights and freedoms? Team Work, Communicating, Critical Thinking, Empathy. Relevant parts of year 8 achievement standards: Students analyse features of Australian democracy, and explain features of Australia’s democracy that enable active participation. They analyse issues about national identity in Australia and the factors that contribute to people’s sense of belonging. When researching, students investigate Australia’s political and legal systems and critically analyse information gathered from different sources for relevance. They explain different points of view on civics and citizenship issues. Students develop and present reasoned arguments on civics and citizenship issues using appropriate texts, subject-specific language and concepts. Unit of work: Story of Our Rights and Freedoms – Year 8. Level of teacher scaffolding: Low – present some brief scenarios to the class and pose some reflective questions. Resources required: Student Worksheet – one copy per student. Device capable of presenting a video and webpage to the class. Women and the Right to Vote factsheet (enough for half of the class). Aboriginal and Torres Strait Islander People and the Right to Vote factsheet (enough for half of the class). Web enabled devices (enough for one per pair). Keywords: democracy, democratic dissent, democratic process vote, universal suffrage. Overarching learning goal: Students will understand what a democratic process is, specifically the democratic process of voting. They will become aware that not all people have always had the right to vote in Australia. Students will make connections between democratic dissent and the struggle for rights and freedoms.